There is a growing backlash against restaurants offering bottled water to customers. This groundswell of opposition to what was once standard practice is a real indicator of changing attitudes. Increasingly, people are becoming concerned with the environmental costs of bottled water. These costs manifest not only in the plastic, which is often not recycled, but also the costs to the planet associated with their transportation and collection. Why should water be bottled when water filters offer the same high-quality water with a much lower carbon footprint? Customers are using environmental arguments to criticize restaurants who push bottled water. Consumers in the U.S. and around the world are shining a light on these practices and flagging food service providers who aren’t up to the latest trends in environmentally conscious water provision. On the other side of the coin, restaurants which offer clean, filtered tap water are seeing the benefits that come with using it to advertise their businesses as healthy and environmentally friendly. The advantages of filters don’t end there. Compared to the high costs of purchasing and ordering bottled water, restaurant owners can install filters at a relatively low cost and use water directly from the tap. They can then use it to attract customers and goodwill. Water filters are low-maintenance items and do not run up high costs, nor do they clog up refuse containers as water bottles can. The presentation isn’t an issue either—hardy, reusable glass bottles present a sustainable and high-quality image for the customer without the branding that comes with commercially bottled water. Additionally, food service managers can use filtered water in machines that require a lot of water to pass through them. Espresso machines, dishwashers, ice machines, and more all require a supply of water but can be vulnerable to clogging and damage if operated with unfiltered tap water. This is due to calcium and other elements present in tap water that creates lime scale and can either damage equipment irreparably or force increased maintenance, which means additional downtime and costs. 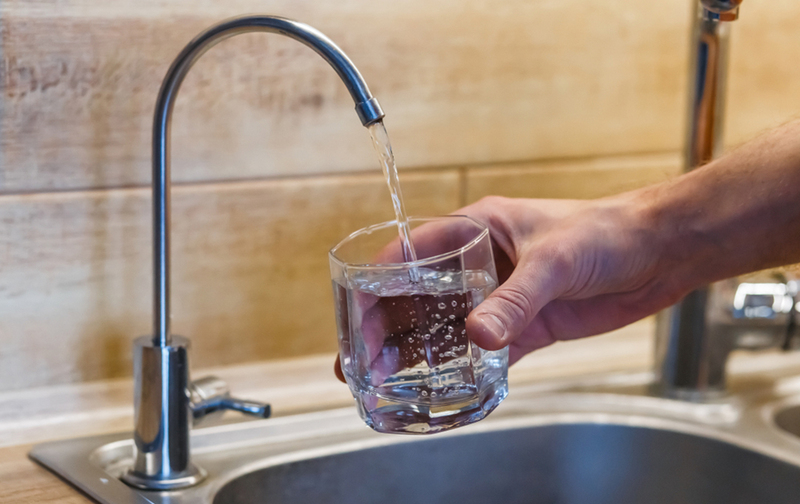 Filtered water is a cheap alternative to bottled water that protects equipment by filtering out elements that cause limescale and other issues. 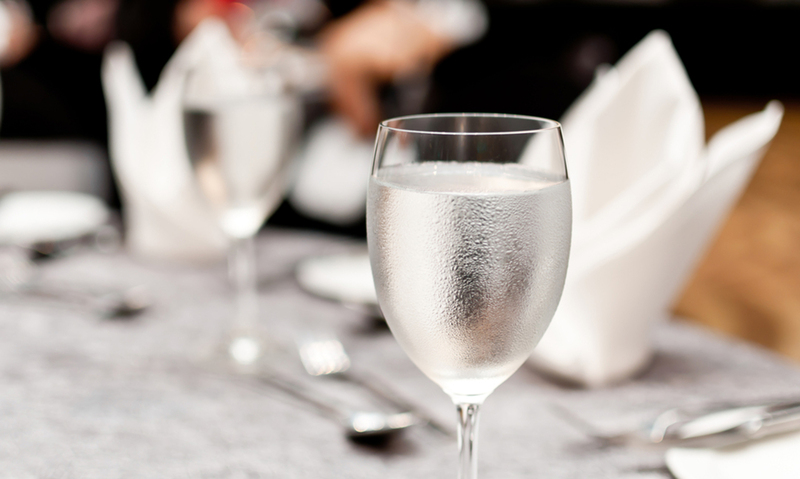 Water filtration in a restaurant can reduce service calls, provide better tasting water, increase equipment efficiency, ensure proper sanitation, and filter contaminants. While you can install a filter to service multiple pieces of equipment, you may also need some dedicated options for some equipment. We’ve researched and listed six of the best below. 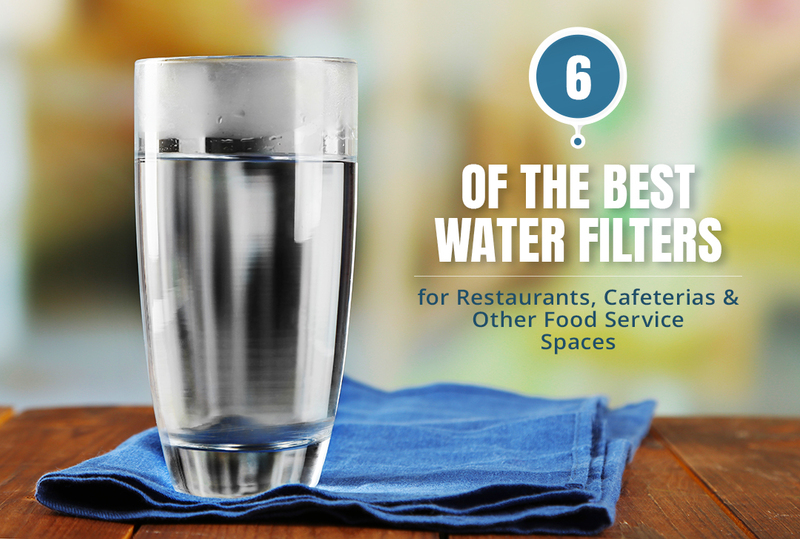 The following six great and varied filters all excel in different ways, for use in restaurants, cafeterias, and other food service spaces. It isn’t an exhaustive list, and every prospective filter owner should do their research, but this should give you a good idea of the market and present some good options. BevGuard water filters offer a great compromise of quality and price. This mid-range filter is non-carbonated with a 10-micron rating. 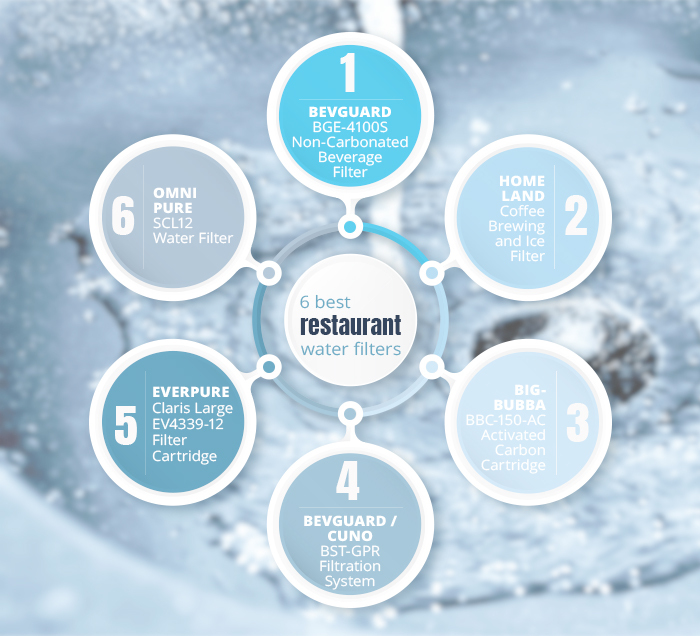 The great thing about this filter is that is compatible with many systems that use brands such as Cuno or Everpure. The advantage of this is that the filter might fit into your already existing filtration system with minimal inconvenience. BevGuard filters use designs specifically tailored for the beverage and food industry, offering great day-to-day performance without the high prices that come with some other brands. The company has focused on the specific needs of the foodservice industry to produce a product that works well in a kitchen environment and performs its listed function beautifully with no frills or fuss. It is a professional filter for a professional space and, at this price, you might struggle to find a more efficient filter for your restaurant. This single-filter cartridge system encapsulates the filter in either a plastic or metal housing. The filter is multi-stage, which gives it performance for high-flow applications. This is critical when filling orders quickly and using filtered water in a range of applied circumstances. Consider that a table of people has just asked for tap water at the start of their meal while another party requests a round of espressos with their dessert, and the machine has just run out of water. For cases like these, a multi-stage filter, such as the one used by the BevGuard BGE-4100S, is an invaluable asset. It uses sediment phosphate filtration with a flow rate of four gallons-per-minute. That’s some serious flow, making it sufficient even for larger restaurants. It has a lifecycle of approximately 12 months or 20,000 gallons. At an affordable price that won’t break the bank, it is a great investment. Overall, this is a good standard no-frills filter for a conscientious restaurateur. Coming in at a slightly lower price than the BGE-4100S, the Homeland Coffee Brewing and Ice Filter offers some interesting features for its price point. Homeland markets this line of filters as the next evolution in filtering. Their filters meet NSF standards for office coffee service, vending, and water industries. It’s simple enough to understand: This filter is made to clean water and make sure it tastes good. Coffee is the fuel that keeps millions of workers focused and alert throughout their day. By investing in a filter, you can keep coffee tasting great and workers happy. People who drink coffee every day become connoisseurs of the bean, and chlorinated water with odor and a bad aftertaste are liable to ruin the blend. This filter inhibits limescale and eliminates the taste and odor of chlorine. Although it doesn’t have the lifespan of some other filters, with only 6,000 gallons or six months of use, this filter could dramatically improve the quality of hot drinks served in your cafeteria or cafe. In doing so, you could raise job or customer satisfaction without breaking the bank. 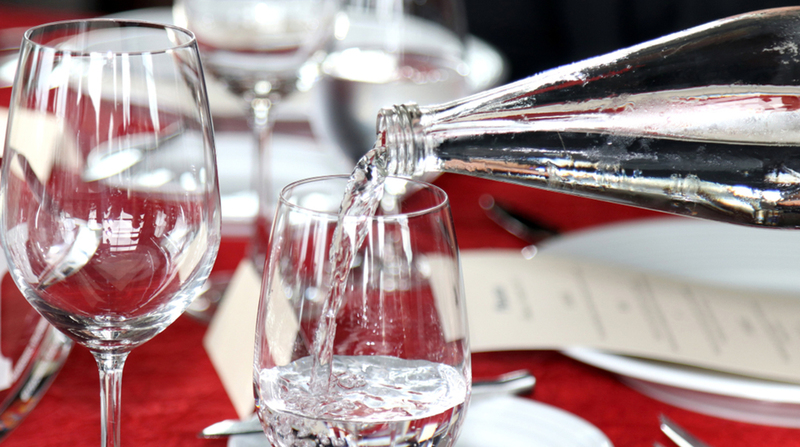 The lower flow rate of 1.5 gallons-per-minute might cause a problem in a restaurant setting when tables are requesting water to drink directly. However, this is more than sufficient for a café—unless your cafe is selling 1,000 espressos a minute! This is a filter to consider for food service spaces that specialize in hot drinks and are looking for a great taste to offer their consumers. Additionally, Homeland filters are, as their name suggests, made in the U.S. This is another great environmental incentive to consider their filters for your business. The Big-Bubba BBC-150-AC is a much higher-level option than the filters examined so far, with a higher price to match it. One of these is likely to set you back at least $370. So, what bang do you get for all that buck? Well, as the name suggests, the BBC-150-AC Activated Carbon Cartridge uses activated charcoal, which is highly effective at filtering chlorine and eliminating almost all taste and odor present in the tap water. It boasts an efficient sediment filter that could last you up to 200,000 gallons. Consider that this filter might save you money in the long run when compared to cheaper filters that might only tolerate a fraction of the use. The flow rate dwarfs many others as well. At 12 gallons-per-minute, this behemoth of a filter can easily service the needs of a large restaurant complex. Although aimed at home use, there is no reason you couldn’t use this filter in a food service environment. The technology within the filter means there is no release of fine carbon particles into the filtered water, and the capacity and flow are great enough to cope with the demands of commercial use. Naturally, the high entry price for this filter presents a barrier for many business owners. With so many costs to consider, spending so much on a filter might not be an option for everyone. 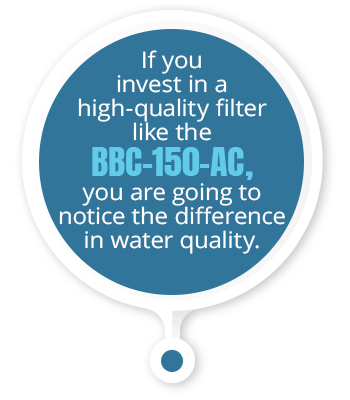 Despite this, if you invest in a high-quality filter like the BBC-150-AC, you are going to notice the difference in water quality. This is especially true in a location such as a big city in a dry state where water supplies are scarce and a lot of treatment is required to meet demand, resulting in higher chemical levels in the drinking water. With a filter like this, your establishment could be the talk of the town. This is an advanced filter. Advanced filtration users with a high business turnover could look at this as a sound long-term investment with the potential to reflect well on their brand. This is a slightly different product. Although not a filter, this triple-head system allows you to combine multiple filters. Make sure to check compatibility to avoid issues when choosing the filters. Included are a pressure gauge, head, bracket, screws, straight fittings, and a pressure relief valve. Having that valve provides some insurance should your filter malfunction, and it may prevent filters from being damaged in such an instance. This kind of product is great for food service providers looking to achieve just the right taste to complement their tea or coffee. There are lots of filtration configurations to experiment with, and providers of high-quality water filters, such as Water Filters Fast, are typically happy to assist you in learning more about the options available. This is another high-end filter, but, unlike the Big-Bubba offering, this filter uses a special design with commercial use in mind. Specifically, this filter aims to achieve the ultimate water taste by tackling chlorine, taste, odor, scale, sediment, dirt, and rust effectively. The flow rate is low, at only one gallon-per-minute, because this filter is a highly specialized product designed almost exclusively for the perfect cup of java. Everpure promises that the Claris Large EV4339-12 provides the user with consistent and precise adjustment of carbonate hardness to suit your exact needs. They further suggest that using this filter gives coffee “perfect crema, full flavor, and pleasant aroma,” which is sure to excite any coffee enthusiast. Although expensive, this is the filter you want if you’re looking for that perfect taste for your high-end boutique cafe, allowing you to charge top prices for the best cup of coffee around. Additionally, the quality of filtration provided by this model can significantly extend the life of your coffee machine, partially offsetting its own high cost. Last, but not necessarily least, is the Omnipure SCL12. This affordable filter is a great slim filter that makes a real difference compared to unfiltered tap water, and at a wallet-friendly price.It doesn’t have all the bells and whistles of some of the more expensive specimens, but this is a great entry-level model for filtration. It promises to reduce taste, odor, and scale with a lifespan of six months or 2,000 gallons.Although the Omnipure SCL12 isn’t likely to win any awards for taste, it is a significant improvement over tap water at a very affordable price. Consider the SCL12 if you run a smaller business and want to improve employee satisfaction on a tight budget. This array of filters covers a wide variety of price points and uses. Ultimately, you need to decide what filter is right for your commercial venture, but this list should be a great starting point.Be sure to check the specifications of any filters you buy and compare them with the competition so that you can calculate any money saved in the long run. Cartridge replacements are typically reasonably priced, but you should also consider their cost when making your purchase and planning your filtration solution. Whatever filter you choose, make sure you install and maintain it properly to get the most value out of your purchase. Whether you’re chasing the perfect cup of coffee or just want a humble, savvy improvement to the quality of life of your business, there’s a filter appropriate for your business.